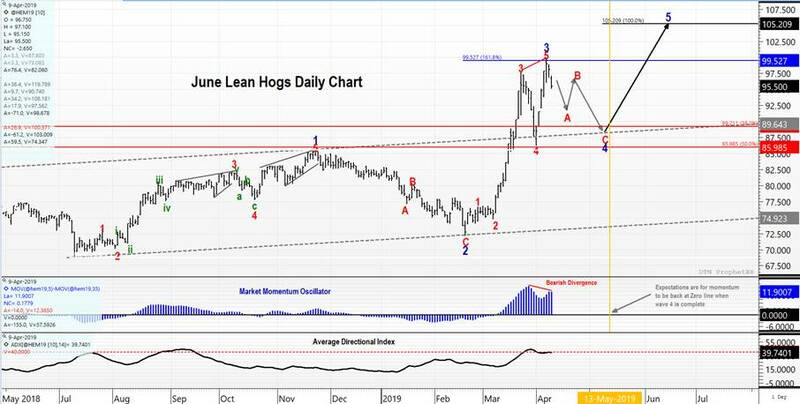 Lean Hogs Technical Analysis Update - Tuesday Technicals - Trilateral Inc. The hog market abides by our forecast the last few weeks, even at a pace a touch faster than expected. This is good as the market is not testing patience. When your patience is tested, it can often lead to poor decision-making (exiting too early and missing windfall profits or hanging on too long until it seems the whole world is watching until you cut a loss). You always want to remain in a stable mindset when making market decisions, and listen to your body’s energy and fatigue levels. The recent hog market has made it easy to do that as it quickly rewards. Bearish divergence between the last price high and momentum, suggesting a reversal is near. ADX line appears to be moving below the 40-line. The ADX measures how much a market is trending. If it moves from above the 40 line to below, that implies the market trend is slowing (potentially reversing). Buyers should be looking to re-enter the market as wave 4 progresses. If the current decline plays out in 3 waves (A-B-C), occurs within parallel lines, and is accompanied with the momentum returning to the zero line, we can be confident to re-enter the market from a long position. The overall trend is clearly up. Current price levels are ideal to exit long positions, but not ideal to add short positions. Remember, “the trend is you friend”. If one were to enter a short position and the market made a new high, there is no telling where it can go. This means we have no way to define risk. That is a bad trade to enter. Short positions would definitely need to put a stop at a new high in the market. The better course of action is to sell long positions here and re-enter the market from the long side on the wave 4 pullback. Because Elliott’s Rule 10 of Impulse Waves states: “wave 4 can never move beyond the end of wave 1”, we can define our risk from a long position at 85.52 (the top of wave 1). A close below $85.52 would negate the current interpretation and negate the reason for getting long. If we add longs at the target of $89.50, then we are risking $4 to potentially gain $16 to the upside (wave 5 target). That is well-defined risk-reward of 1:4. It should be noted that this market has potential for a blow-off top in wave 5 top that will yield much larger gains than the modest upside target given. Buyers should become a bit aggressive with their purchasing decisions as the wave 4 appears to play out as described above. If you do not currently have an account with Trilateral, we strongly suggest that you consider a non-binding free trial for additional news and analysis on commodity futures markets including our Livestock and Protein Update.